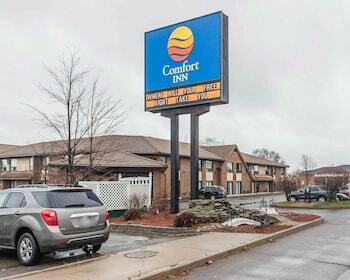 Located in Pembroke, Comfort Inn Pembroke is in the business district, a 4-minute walk from Champlain Trail Museum and Pioneer Village and within a 5-minute drive of Pembroke City Hall. Featured amenities include a 24-hour business center, complimentary newspapers in the lobby, and dry cleaning/laundry services. Free self parking is available onsite. With a stay at Maria's B&B in Niagara-on-the-Lake, you'll be a 1-minute walk from Lake Ontario and 12 minutes by foot from Jackson-Triggs Winery. Located in Kelowna, Pinnacle Pointe by DKRA is in a shopping district, a 1-minute drive from Okanagan Golf Club and 7 minutes from UBC-Okanagan. Free self parking is available onsite.